Each distinct X-ray source on the sky identified in the Chandra Source Catalog is represented by a single master source table entry and one or more source observation table entries for each observation in which the source was detected. The catalog is modeled as two table views: the Master Sources Table and the Source Observations Table. In each table, a row represents a source, and each column a quantity or parameter that is officially part of the catalog. 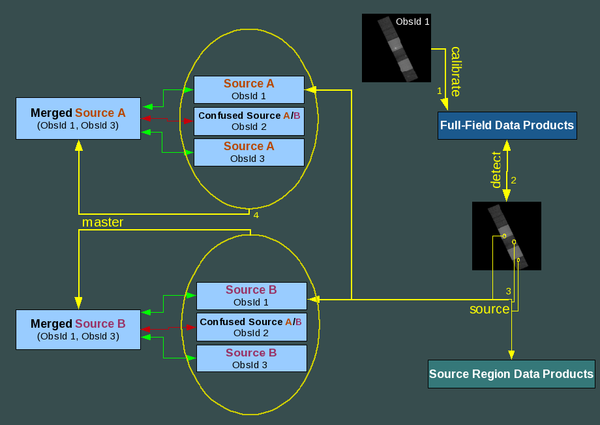 If a source is detected in multiple observations that overlap the same region of sky, then the master source table entry is produced by merging the corresponding individual source observations. The properties of a master source observation represent the best estimates of the actual source properties derived from the set of individual source observations contributing to the master source observation. 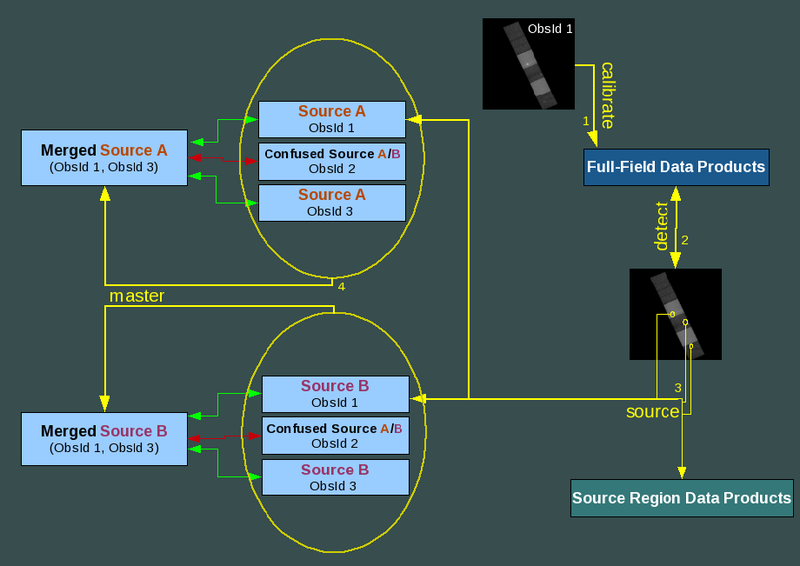 The master source properties are recorded in the Master Sources Table, categorized by the following areas: Position and Position Errors, Source Flags, Source Extent and Errors, Source Fluxes, Source Significance, Spectral Properties, and Source Variability. The Column Descriptions pages describe how each master source property is determined. The Source Observations Table contains source properties based on observational data extracted independently from each Chandra pointing in which the source is detected; it may contain multiple entries corresponding to a single master source entry in the Master Sources Table. Additionally, a number of observation-specific properties are reported in the Source Observations Table, such as pointing and instrument information, as well as links to file-based full-field data products, such as background maps, bad pixel files, and exposure maps. A number of source-specific data products are produced as well, including source region event and PSF files, among others; see the Data Products section for the full list of CSC file-based data products. Figure 1 demonstrates that all "master source/source observation associations" in the catalog, whether ambiguous or unique, are transparent to the user. This feature allows a request of any combination of master source properties and per-observation source properties in a single query to the database, so the user is not restricted to searching a single table at a given time, and can understand how all observations of a single source contribute to a master source entry. Figure 1. Properties of per-observation sources which uniquely match a master source (and are not saturated) contribute to the reported master source properties (represented by the green arrows). Per-observation sources which are confused are ambiguously matched to at least two master sources, so their properties do not contribute to the reported master source properties (as represented by the red arrow). The Catalog Processing section describes in detail how the catalog is created from individual Chandra data sets; see Figure 2 for a pictorial demonstration of the connections among all components of the catalog. Figure 2. The connections among all components of the Chandra Source Catalog, with the names of each Catalog processing pipeline in yellow text. Because the Chandra point spread function (PSF) widens significantly with distance from the optical axis, detections far off-axis in one observation may overlap multiple resolved sources detected on-axis in another observation; such detections are flagged as "confused." In this case, the individual overlapped source entries are linked to the master catalog entry, but the data are not used to compute the master source properties. Furthermore, if the estimated pile-up fraction exceeds ~10% for an individual ACIS source observation, then its properties will not contribute to the master source properties unless all of the other observations of that source are piled-up. Lastly, it is worth noting that in the first catalog release, source regions output by wavdetect from a single observation are by definition treated as distinct sources, even if those regions overlap significantly.